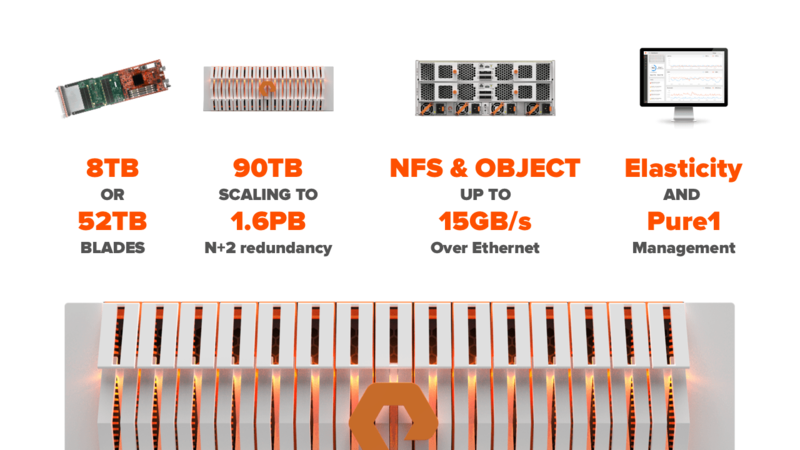 Today Pure Storage announced FlashBlade, a truly innovative advancement in All-Flash storage technology that will revolutionize the use of capacity-optimized storage platforms with traditional and emerging workloads. 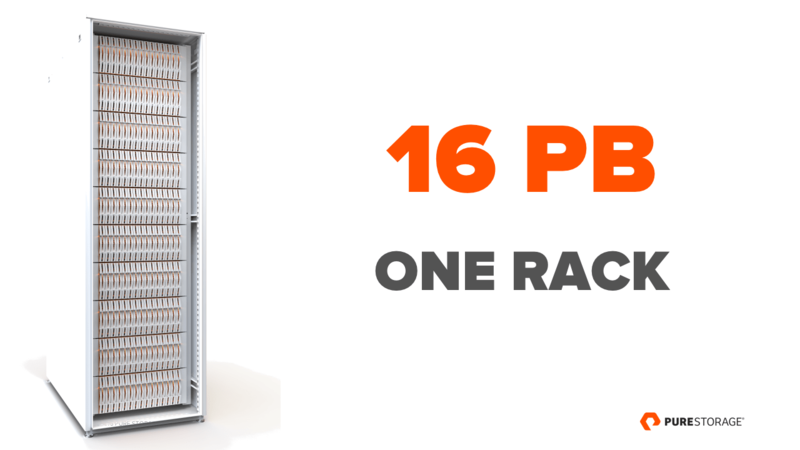 Just imagine what you could accomplish from a storage platform that delivers the performance of flash and PBs of elastic scalability in 4 rack units for less than $1 per usable GB. That’s less than the cost of going to the cloud that’s all-flash and resides in your data cnter! 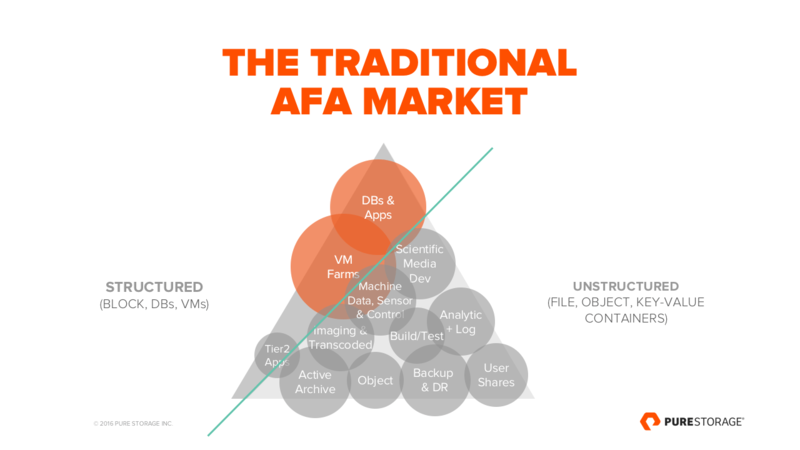 For many the all-flash market has only recently become a viable replacement for 15K and 10K based arrays as the legacy disk vendors are no longer able to explain away the market share losses of their tier-1 storage platforms. The volume of unstructured data is exploding globally. It’s the fastest growing data set in the data center (and cloud) with 500 quadrillion files created annually (and increasing). The struggle to address this growth with traditional scale-out NAS arrays and open source based server platforms powered by slow 7,200 RPM SATA and NL-SAS drives screams for innovation in the storage industry. 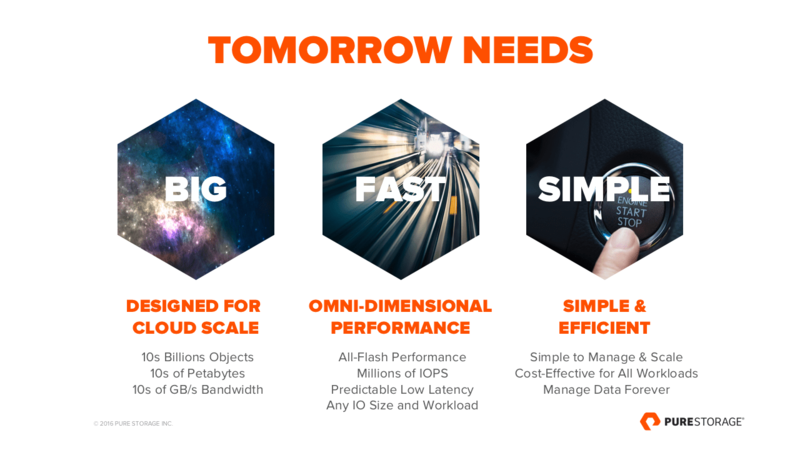 With FlashBlade, Pure Storage is solving these challenges while also unleashing a new level of performance, economics and data center efficiency. Want in on a counter-intuitive industry secret? Most block-addressed all-flash arrays like the FlashArray //m support workloads that require nowhere near the advertised performance limits. 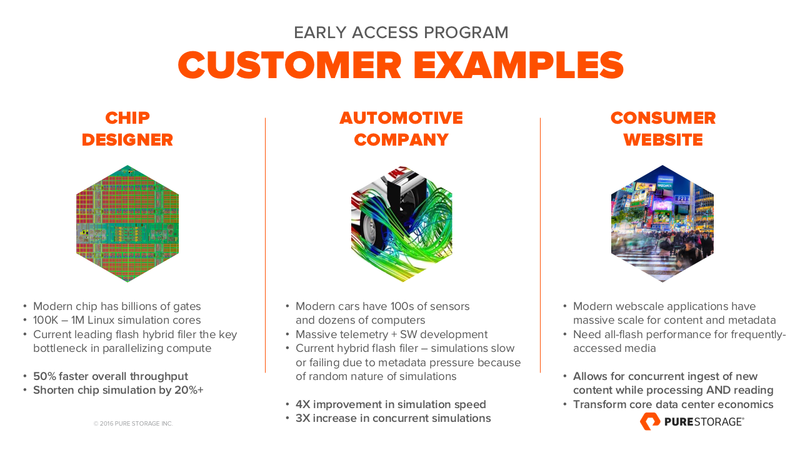 In reality, for every customer who accelerates a demanding OLTP database, two customers adopt an all-flash array to simplify operations, reduce data center footprint and reduce server footprint and software licensing costs. With FlashBlade, I expect we will see the performance promise of flash take center stage. The benefits available to large scale applications and processes that are measured in terms of wallclock time will unlike any performance gains seen in the last decade. The initial release of FlashBlade will target computational intensive datasets and cloud-scale applications like bioinformatics, cyber-security, design and simulation, forensic workloads, and ‘Internet of Things’ (aka sensor and telemetry data processing). 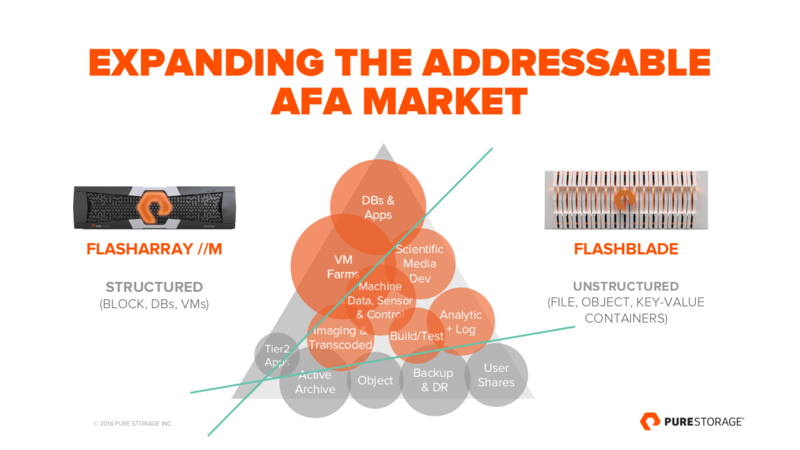 Over time the plan is for FlashBlade to expand into more common NAS use cases include file services and backup. While these examples may not require the performance of flash, organizations will benefit from massive data center efficiencies in power, rack space and operational simplicity. FlashBlade provides 1.6PBs of usable capacity and 15GBs of bandwidth to NAS and Object accessed workloads in 4RU. It’s the culmination of a massive engineering effort. Part blade-based scale-out architecture, part distributed operating system (Elasticity OS), part software-defined networking, and part flash memory (which is not SSD based). In addition, there’s no SCSI interfaces, SAS networking, interposers or legacy interfaces which ultimately impact the efficiency of which IO can be transferred between memory based devices. The engineering team has delivered an amazing amount of work in making FlashBlade a reality. FlashBlade is designed to start with a few as 7 blades and can scale to hundreds, linearly and simply. Theres no jumble of cables like traditional all-flash scale out platforms – a software-defined, 40GbE cluster network is included in the chassis. Minimizing complexity and points of failure. 8TB Blades are currently available for early access customers. 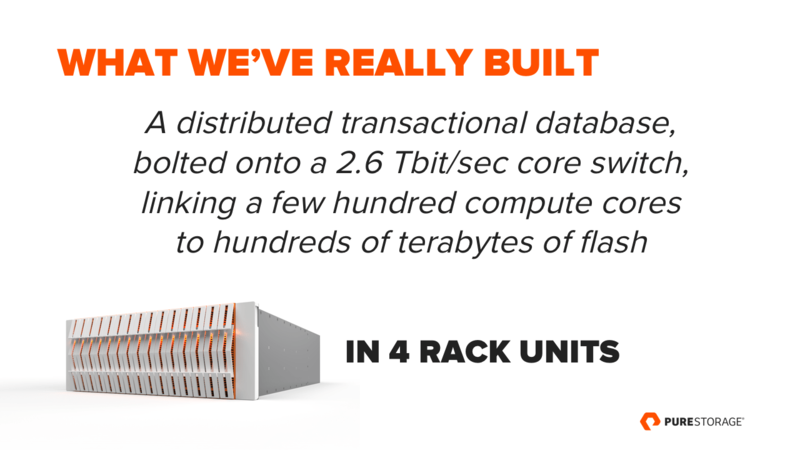 At the time of general availability (scheduled for the second half of 2016) we plan to support scaling two FlashBlade chassis and making 52TB blades available. FlashBlade will scale performance linearly while supporting mixed blade capacities and without the need to migrate or rebalance data (and support our Evergreen storage model). Equally important is the future-proofs scale of the metadata. Elasticity supports the creation of over 100 million unique objects/files, every second for 20 years… per blade! One could consider each blade as an independent storage controller complete with an Intel Xeon system-on-a-chip, DRAM memory, NVRAM and MLC NAND flash (3D TLC NAND will follow in the future). Each blade runs the Elasticity OS and is connected to a 40Gb Ethernet fabric interconnect. Like Purity on the FlashArray, Elasticity powers the FlashBlade. it provides the access protocols, flash reliability, data reduction, and enterprise-class data services. Data is protected based on a N+2 erasure coding with LDPC error recovery. This design allows for the simultaneous failure of two blades and enables non-disruptive software upgrades and hardware expansion. 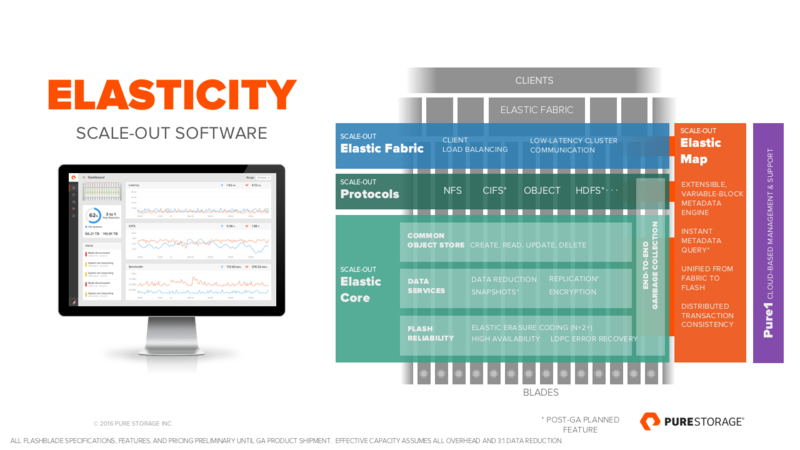 The early access (EA) release of Elasticity includes support for NFS v3 (file) access over 10GbE, global data compression based on a variable block size metadata engine, data encryption, system-wide garbage collection and queryable metadata. The current plan is to increase functionality with the addition of S3 (object) access, data deduplication and support for two chassis with the GA release and continued development to deliver SMB (aka CIFS) and HDFS access protocols, advanced data services like snapshots and replication, support for higher performance Ethernet speeds and expanding the number of supported chassis. 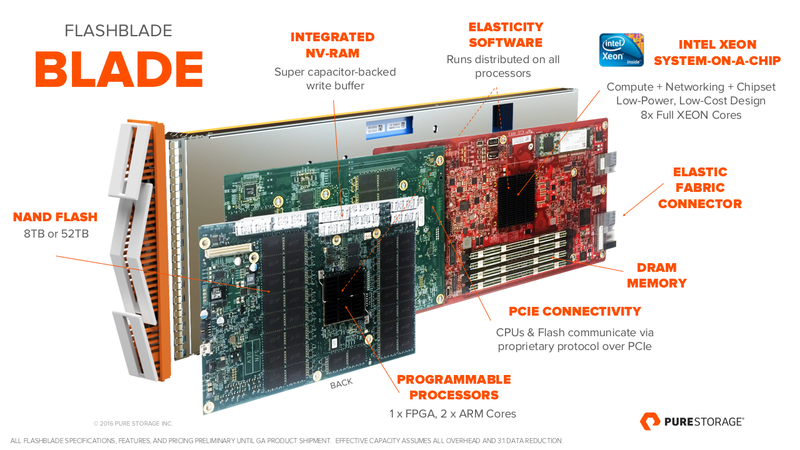 As you’d expect from Pure, we’ve focused on delivering simplicity with FlashBlade. This includes our SaaS-based software model, and the proactive support our customer love from Pure1. Even the Elasticity OS includes an elegant GUI that FlashArray (Purity OS) users are very familiar with and both platforms share the same CLI interface and command set. Why learn a different interface just because you have two different platforms? Simplicity seems to be an element that gets overlooked in favor of storage IOPs and throughput but it’s the unit of measurement that enables organizations to scale their staff. Simplicity allows you to tackle the scale challenge that is the byproduct of Moore’s Law. Today’s announcement is only the beginning for FlashBlade. With 1.6PB in 4RU at less than $1 a GB we are delivering storage beyond whats available in the cloud. If you have a need to support hundreds of thousands of hosts and billions of objects, FlashBlade might be a game changer for you. I’ll try to share more FlashBlade specifics in future posts. 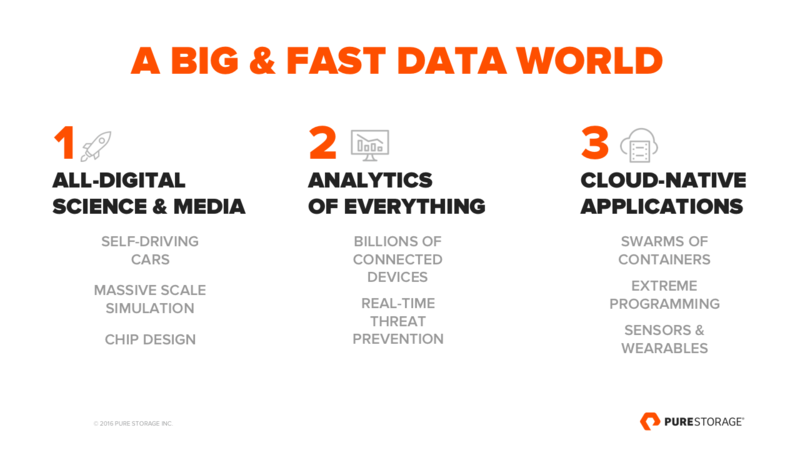 For those who need more information now, head over to Pure Storage or better yet, join us the live stream from our user conference, Pure Accelerate.